Chris Larsen enters his second year as the head coach of the men’s and women’s golf teams. Larsen's team played four fall tournaments and four spring tournaments in their inaugural season, closing out the year at the A.I.I. Conference Tournament in Phoenix, Arizona. Larsen was pleased to see much improvement in his young team and looks to build upon this growth as the team heads into the 2018-19 season. 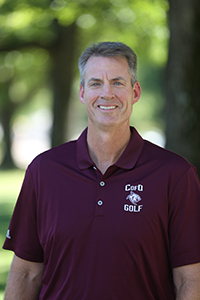 The College announced the addition of a golf program in 2016 and placed Larsen at the helm. Since that time, he has been hard at work recruiting players, establishing the beautiful Buffalo Ridge Springs Golf Course as the team’s home course, developing on-campus practice facilities, and working on player development. Larsen obtained his BS from College of the Ozarks in 1992, where he was a standout on the basketball court. Larsen received an M.S.Ed. from Southwest Missouri State University in 1997 and went on to obtain his doctorate, earning an Ed.D. from the University of Missouri in 2004. Larsen also serves as the dean of sports, recreation and events for the College. He and his family reside in Point Lookout, Mo. Kim Vinton returns for her second season as the team’s assistant coach. Vinton is a University of Arizona alumnus, where she was a 4-year letter winner on the #1 nationally ranked women’s golf team. She was also a member of the Pac Ten All-Star team and inducted into the Arizona Hall of Fame. Vinton comes to College of the Ozarks with a wealth of talent and experience. She has played golf professionally for 15 years all over the world, including 2 years living and playing in Japan. In addition, Vinton is a skilled and knowledgeable instructor of the game, having served as an assistant golf coach at the University of Arizona, coached the Women’s NCAA Golf Champions in 1996, taught at the Los Angeles and Ledgestone Country Clubs, and more. If you are interested in joining the Bobcat Golf team, please complete the Bobcat Golf Questionnaire.